This beautiful Embroidery floor pillow is the perfect way to add extra seating that’s fun and funky. Handmade by artisans in Jaipur/Rajasthan, this bohemian style floor pillow is made from the mandala and medallion inspired tapestries that we also carry. You will receive this product unfilled for easier shipping with filled we offer vacume packed You can easily fill it with fabric scraps or any filler material of your choice. Toss a few pieces around to add more seating to any space, from the formal living quarters to your entertainment room. 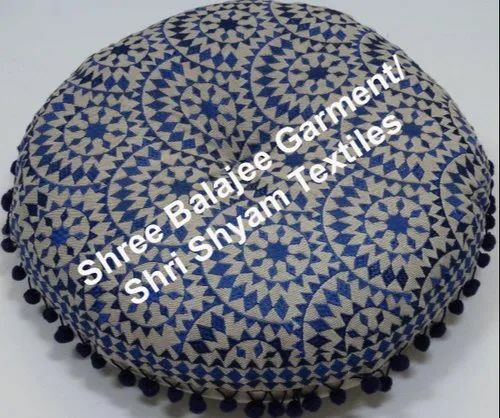 Established in year 2014, we 'Shri Shyam Textiles & Home Decor' we are well known manufacturer, exporter and wholesaler of Quilt, Cushion Cover & Vintage Bags. Our product range Kantha Quilt, Indian Block Print Quilt & Floral Kantha Quilt. Backed by a team of experienced professionals. Our offered products reflect the creativity and workmanship of our skilled professionals. These products are designed and developed using the finest quality raw material that assures their high durability. Further, our offered products are highly treasured among clients due to their attractive designs, unique patterns and vibrant colors. Our professionals are well aware of client's requirements and design these products in tune with latest trends of the market. Also, we are providing customization facility to our clients in order to provide maximum satisfaction to them. In addition to this, we are equipped with ultramodern infrastructural unit that enables us to fulfill bulk requirements of clients in a timely manner. We provide these products in superior quality packaging material that assure flawless products are delivered at client's end. We are exporting our products Globally.